I’ve had wonderful summer renters again this year. As I move over to our nearby farm, Pey Froment, for a month or go off to Italy or the US to vacation with my family, it’s a perfect moment to share my home and garden. I think everyone was delighted. It’s fun to have several generations in the house, parents, children and grandparents where everyone finds their place. Two upstairs family suites with a single and then a children’s room full of new toys is a certain hit with the under 10s… while grandparents find peace and quite in the Terrance Room. As the hay hadn’t yet been cut in the garden fields there were plenty of private paths where the little ones could play hide and seek while their parents read in the shade. Even the piano was used: Grace and Samuel gave me a little concert while their parents visited Chateau Cheval Blanc ! The first two weeks of august are still available ! The first two weeks of august are still available if you’d like to rent La Forge and the guest cottage for your summer family reunion…or vacation with friends. An English family has reserved the main house from July 14th for two weeks. 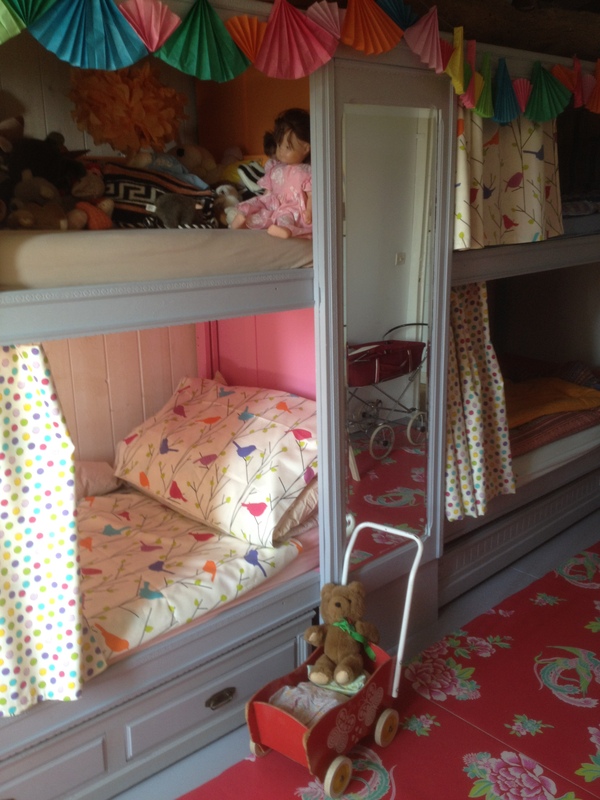 We now have a wonderful, small, children’s room with 4 “lit clos”..that look tempting even to some of my adult guests. RENT OUR HOME FOR A MONTH THIS SUMMER ! Again this year we are meeting up for a family reunion in Italy. I’ve told everyone that my B&B will probably be closed from July 14th to Aug 12th…so I’m looking for just the right family or group of friends to rent our home for the month while I’m gone. Friends will be near by if you have any questions and I have a gardener and a house keeper who will come to keep things tidy. The price is 3000€ for 2 weeks or 4000€ for 3 weeks and 5000€ for the month ! It sleeps 7 + a children’s room for 4 ( see the rooms on my B&B pages) and you can just move in and feel that you are French for the summer. Please pass the word along. Of course I’ll give priority to my former guests. If you take the cottage as well there’s enough room for 10 + the children’s room. The cottage is 600€ per week if rented on its own but only 400€ if rented along with the main house. HURRY AND RESERVE NOW !! La Forge is an hour from the Atlantic ocean beaches and 5 minutes from our private family pool at our farm at Pey Froment (1 mile away) . St Quentin de Baron is 45 minutes from the Bordeaux airport and 30 minutes from the train station. On this sunny, cold and snowy day I’ve finally sent out my new years cards to family, friends and guests as well as a notice of new links and information here on my blog. One of my new years resolutions is to write more often ! Of course I’d like to tempt you all to come and visit. A photo of La Forge in the snow is perhaps not the best way to entice you to come to France when many of you are probably already looking forward to the warmth of summer. But I promise, this only happens once a year…and not even every year ! For a mid-westerner like me I’m delighted to have the crisp snow of my childhood. And of course, as no one knows how to drive on snow here in Bordeaux everything comes to a stop ! Schools are closed, stores have a hard time keeping supplies, the streets are empty except for a few cars that crawl along. You see people walking along the roadside in the snow marveling at the beauty and the silence…but looking forward to tomorrow when it will have all melted and they can get back to business as usual. Enjoy the blog, take some time to explore my new pages ! And think about coming for a vacation…or even more if you’d like to be French for a couple of weeks…the whole house and cottage are available to rent for a family or group of friends from mid July to mid august. You can check out the details on the page “Summer Rentals”. 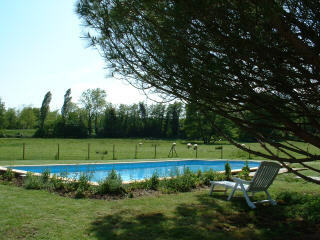 LAST MINUTE NEWS: would you like rent a French country house for this July ? ! As I’m going to a series of family weddings in France and in Michigan I’ve told everyone that my B&B is closed until the 25th of July…I’m looking for just the right family or group of friends to rent it for a couple of weeks while I’m gone. Bruno will be near by if you have any questions and I have a gardener and a house keeper who will come to keep things tidy. The price is 3000€ for 2 weeks or 4000€ for 3 weeks ! 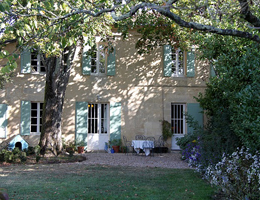 It sleeps 8 (you can see the rooms on my B&B pages) and you can just move in and feel that you are French for the summer. Please pass the word along. Of course I’ll give priority to my former guests. If you take the cottage as well there’s enough room for 10 people. HURRY AND RESERVE NOW !! 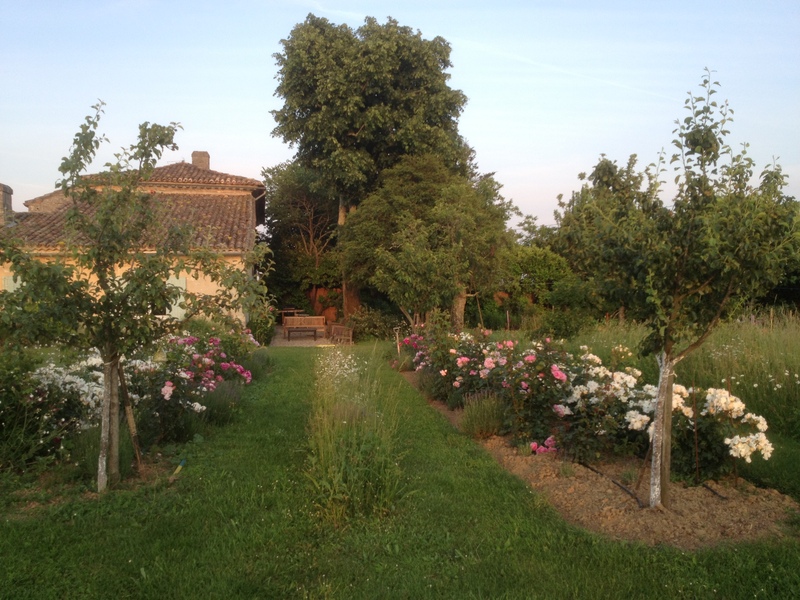 The house is 45 minutes from the Bordeaux airport and 30 minutes from the train station. As an American having lived in France for all of my adult life I started http://www.whatscookinginfrnace.com as the perfect way to get to know the French and France. I’ve established a intimate network of friends with Bed and Breakfasts “à la Française” in country houses and Paris apartments. I propose organising winetastings with passionate experts, cooking classes in private home kitchens, lunches with new French friends, visits to extraordinary gardens, to artists’ studios and to their collectors’ homes and gallerys . I also want to let you know what’s going on at the moment that you shouldn’t miss. I can help you put together your next trip to France… to those places off the beaten track where you’ll experince France better than you ever imagined.